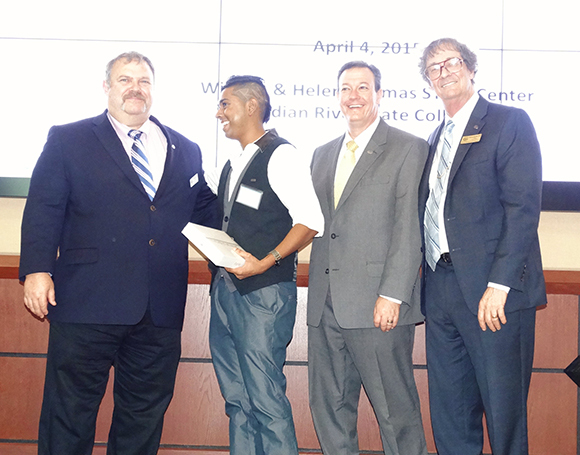 Tevin Ali (second from left) with (from left) Dr. Paul Horton, Indian River State College assistant dean; Dr. Anthony Iacono, IRSC vice president of academic affairs; and Dr. Harvey Arnold, IRSC Pruitt Campus Provost, after being announced as first-place winner for his oral presentation at the 2015 Life Sciences South Florida STEM Undergraduate Research Symposium on April 4. Doors keep opening for Tevin Ali, a student in Palm Beach State College’s Biotechnology program. The latest is his first-place victory in the oral presentation competition at the 2015 Life Sciences South Florida STEM Undergraduate Research Symposium. Overall 70 students presented in either oral or poster competitions at this third annual event held April 4 at Indian River State College. They represented Barry University, Florida Atlantic University, Florida International University, Indian River State College, Miami Dade College, Nova Southeastern University and Palm Beach State. Ali’s winning presentation was based on research he’s doing as an intern in the laboratory of Dr. Matthew Disney on the Scripps Florida campus. Titled “Designing Drug-like Compounds That Target microRNAs,” his presentation focused on his work to stop microRNA interference in gene expression, which is associated with several disorders such as Alzheimer’s disease. Ali came away with an iPad Air tablet, but also a renewed confidence that he’s on the right path—a path that started at Congress Middle School in Boynton Beach. He credits science teacher Kaylin Markman. “She went above and beyond in many ways, like dedicating a whole semester to teaching forensics, which steered me toward biotech,” says Ali. He graduated from Spanish River High School’s Biotechnology Academy in 2010 and recalls how Eric Dybas, coordinator of the program, was a major influence in his career choice. Ali studied biotechnology at New York University before returning to Florida and discovering Palm Beach State’s Biotechnology Associate in Science degree program and its extensive range of internships. 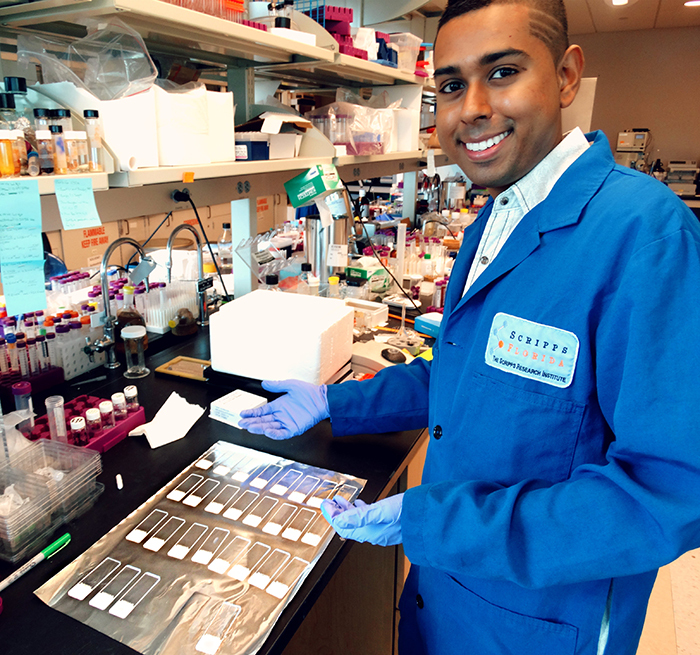 Tevin Ali conducts microRNA research as an intern in the laboratory of Dr. Matthew Disney on the Scripps Florida campus. When Ali graduates from Palm Beach State May 11, he’ll also leave behind the Biotechnology Association student club he founded and led. He recently received the Palm Beach Gardens campus’ Student Leader of the Year award for his efforts. Dr. Becky Mercer, director of the Biotechnology program and STEM Education, also reports that Ali was active in the program’s community events, high school outreach, mentoring, recruitment, and served as a supplemental instructor for the Biotech 1 Lab course. Indeed, Tevin Ali, now 23, is already starting his future. His Scripps Florida internship has turned into a job as a research technician, and he will pursue his bachelor’s and master’s degrees. He plans to get his bachelor’s degree in biotechnology but is considering an MBA for his master’s degree. “My ultimate goal is to be on the business side of the biotech world, perhaps even starting up my own biotech company,” says Ali. While this season of awards assures him that he can do very well in this field, it’s also caused him to reflect on how he got here, citing the encouragement of his middle and high school teachers, as well as Mercer, who opened up many opportunities, including the Life Sciences South Florida competition. 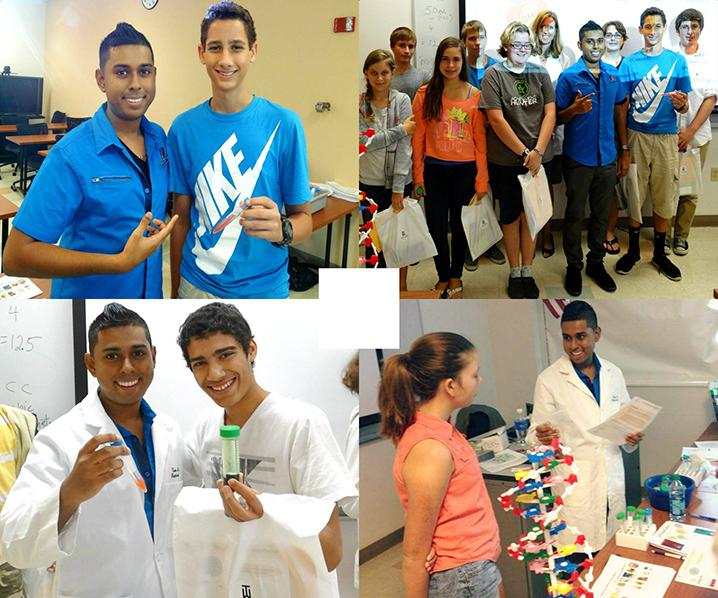 Tevin Ali, named Student Leader of the Year on the Palm Beach Gardens campus, founded and led the Biotechnology Association student club and did outreach as a biotech ambassador to area high schools. Shown here: Ali teaches a class of students in grades 7 to 12 at the Tiger Woods Foundation STEM Career Conference. © Palm Beach State College. All Rights Reserved.